2018 College Football MVP’s Of Week #12! All MVP Players Must Be On Winning Team! Washington State East Carolina Transfer And Super Passing Quarterback Gardner Minshew (6-2, 220, 4.92) from Brandon, Mississippi had another Incredible Game Against The Arizona Wildcats as he Completed 43 or 55 Passes for an Incredible 473-Yards and 7 Touchdowns, a 11-Yard Average Per Catch, and a 192.4 Quarterback Rating in The #18 Ranked Washington State Cougars 69-28 Victory over The Arizona Wildcats. In this Game, The Cougars Super-Star Quarterback Broke The Washington State School Record of Seven Touchdown Passes and The Cougars Might have given themselves a Real Longshot for a Spot in The College Football Playoffs. Minshew (#16) is being Pushed as a Heisman Trophy Candidate and has been named to The Walter Camp Player of the Year Watch List. Minshew is one of 15 players named to the watch list for the fourth-oldest football award in the country. The East Carolina Graduate Transfer is the only player from The PAC-12 to be named to This Watch List. Former Cougar Defensive Lineman Hercules Mata’afa was named as a Finalist for The Award Last Season. Minshew is also a Semi-Finalist for The Davey O’Brien National Quarterback Award and Maxwell Award, and Also Named to The Top 15 for The Johnny Unitas Golden Arm Award. Washington State (10-1, 7-1 PAC-12) was Unbelievable as they Built-Up a 55-14 Halftime Lead and were not Ever Seriously threatened on their way to their Seventh Consecutive Victory. Minshew is The Big Reason why The Cougars are 9-1 and Ranked #8 The College Football Playoff Rankings. Minshew currently Leads the Nation in Yards Passing with 3,852-Yards, Passing Yards-Per-Game with 385.2-Yards, and Total Offense-Per-Game with 393.8-Yards. Minshew is also sixth in The Country with a PAC-12 Best 29 Touchdown Passes and leads The Country with Five Games of 400-Plus Passing Yards. He has also thrown for at least 300-Yards in Every Single Game this Season. With their 10th Victory of the Season, The Cougars matched their School Record that was last accomplished in 2003. They also won their 13th straight home game and set a season high for points. The Cougars host Their Archrival and Ranked #17, Washington Huskies on Friday, and The Apple Cup Winner taking The PAC-12 North Championship. 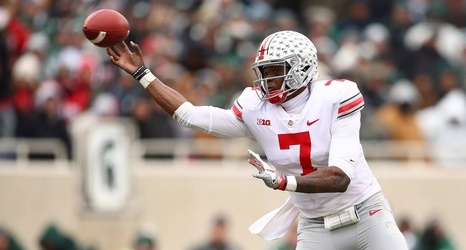 Ohio State Sophomore Athletic Quarterback Dwayne Haskins (6-3, 220, 4.6) had an Incredible Game Against The Maryland Terripins as he Completed 28 of 38 Passes for 405-Yards and a Touchdown and he Rushed 15 Times for Another 59-Yards and 3 Touchdowns, giving him a Mind-Boggling 464-Yards of Total Offense and 4 Touchdowns and a 184.0 Quarterback Rating in The Buckeyes 52-51 Overtime Comeback Victory over The Maryland Terripins. After a 5-Yard Touchdown Run by Haskins (#7) and Giving The Buckeyes a 52-45 Lead in Overtime, Maryland Interim Head Coach Matt Canada made a Gutsy-Call to go for a Two-Point Conversion Attempt Call and Win The Game and it would have Probably Worked, but the Quarterback and Receiver were not on the Same Page, as the Quarterback Had an Easy Pass for The Victory, but he Overthrew His Target and The Buckeyes avoided one of the most stunning Upsets of This Football Season. Oklahoma State Red-Shirt Senior Athletic Quarterback Taylor Cornelius (6-5, 232, 4.81, 32, 4.51) had Another Incredible Game Against The West Virginia Mountaineers as he Completed 30 of 46 Passes for 338-Yards and 5 Touchdowns and he also Rushed for Another 106-Yards on 13 Carries and Another Touchdown, giving him 444-Yards of Total Offense and 6 Touchdowns in The Oklahoma State Cowboys 45-41 Comeback and UPSET Victory over The #7 Ranked West Virginia Mountaineers. Last Week Against The Oklahoma Sooners, Cornelius (#4) was Almost Flawless as he Passed for 501-Yards and 3 Touchdowns, but on one play on a 2-Point Conversion with 1:03 Left in The Game, he Misfired on a Pass to Super-Star Wide Receiver Tylan Wallace in a 48-47 Loss to The Sooners. On this Saturday, However, this Same Connection To Wallace Worked. With 42-Seconds Left in The Game, Cornelius threw an Incredible Touchdown Pass to Wallace and The Oklahoma State Cowboys beat The No. 7 West Virginia Mountaineers in a 45-41 Come-From-Behind Victory. Alabama Sophomore Athletic Quarterback Tua Tagouvailoa (6-1, 218, 4.64, 34, 4.34) had Another Incredible Game Against The Citadel Bulldogs as he Completed 18 of 22 Passes in only Three Quarters, including Touchdowns of 21 and 5-Yards to Jaylen Waddle and an Incredible 68-Yard Touchdown to Super-Star Tight End Irv Smith (6-4, 245, 4.56). In this Incredible Game, Tagouvailoa (#13) also Rushed for Another 37-Yards and Another Touchdown, giving him 377-Yards of Total Yards, 4 Touchdowns, and an Unbelievable 256.6 Quarterback Rating in The Crimson Tide 50-17 Victory over The Citadel Bulldogs. Tagouvailoa also Broke The Alabama School Record for Touchdown Passes in a Single Season of 30, that was Set by A.J. McCarron, as he Reached 31 Touchdown Passes. “Thirty-One touchdowns, that’s cool,”Tagovailoa said. “But we’ve got another game to finish off this season and another game after that. We are more focused on finishing this season the right way.” Alabama still has Auburn and then The #5 Ranked Georgia Bulldogs in The SEC Championship Game. East Carolina Freshman Athletic Quarterback Holton Ahlers (6-3, 236, 4.72, 28, 4.43) had an Outstanding Game Against The U-Conn Huskies as he Completed 22 of 31 Passes for 242-Yards and 4 Touchdowns and he also Rushed for Another 130-Yards and Another Touchdown, giving him 372-Yards, 5 Touchdowns, and a 179.1 Quarterback Rating in The East Carolina Pirates 55-21 Victory over The Huskies. Florida State Junior Athletic Quarterback Deondre Francois (6-1, 215, 4.56) had an Outstanding Game Against Boston College as he Completed 19 of 39 Passes for 322-Yards, including a 74-Yard Game-Winning Touchdown with 1:49 Left in The Seminoles Unbelievable 22-21 UPSET Victory over The #22 Ranked Boston College Eagles. Francois also Rushed for Another 26-Yards, giving him 348-Yards of Total Offense. Francois was Selected as The ACC Rookie of The Year in 2016, but he Experienced a Season-Ending Knee Injury in The Opening Game in 2017. Wisconsin Sophomore Super-Star Running Back Jonathan Taylor (5-11, 231, 4.42, 36, 4.1) had another Unbelievable and Incredible Game Against The Purdue Boilermakers as he Rushed for an Incredible Career-High 321-Yards and 3 Touchdowns in The Wisconsin Badgers 47-43 Victory over The Boilermakers in Triple Overtime. Taylor was Pretty Special for The Badgers as he Completely Wore-Down The Purdue Defense as he Scored Three Touchdowns in The Second Half, including The Winning 17-Yard Touchdown Run in The Third Overtime. Taylor also Equaled his Career-High Carries with 33, while Averaging 9.7-Yards Per-Carry and his Three Touchdown Runs, included Runs of 80, 12, and 17-Yards, Especially-When The Struggling Badgers needed a Huge Boost after their Playoff Hopes and Big-10 Championship Hopes had been Derailed by Three Losses in their last Five Games. Taylor Quickly Jump-Started The Badgers Offense with his Incredible 80-Yard Touchdown Run on The Badgers First Offensive Play in The Second Half, that helped Open-Up the passing game with his strong runs and eventually created enough headaches for The Boilermakers to help Wisconsin overcome a 27-13 deficit in the final seven minutes of Regulation Play before reaching the end zone in All Three Overtimes. Wisconsin (7-4, 5-3, BIG-10) have won 13 Straight in this Purdue Football Series and they needed to win this game and next week in Their Regular-Season Finale to improve their Bowl Potential and Prospects. As a Super-Star Freshman in 2017, Taylor was an Exceptional Freshman Running Back as he Averaging 6.6-Yards Per-Carry for 1,977-Yards and 13 Touchdowns. Ohio State Sophomore Super-Star Running Back J.K. Dobbins (5-10, 214, 4.42, 43.1, 4.09) From La Grange, Texas was Outstanding as an Incredible Workhorse on Saturday in The Huge Ohio State Buckeyes 52-51 Overtime Victory over The Maryland Terripins as he Carried The Football 37 Times and Rushed for an an Amazing 203-Yards. Without The Press or Maryland Coaches knowing about a Quad-Bruise Injury to The Buckeyes Second Team Running Back, Mike Weber, who Suffered The Injury on Tuesday in Practice and it was not Reported until after The Game, even The Sports Announcers on ABC National Television were Puzzled as to why Dobbins was getting all of the Carries, along with Quarterback Dwayne Haskins. In this Incredible Comeback and Overtime Victory, The Buckeyes Rushed for 283-Yards with Dobbins Rushing for a Career-High 203-Yards and Haskins Rushing for 59-Yards, along with 405-Yards Passing, as he was a Surprising Complement to Dobbins, who shouldered most of the Rushing Load. Dobbins came into his Sophomore Season with Outstanding Heisman Trophy Potential, but that has Quickly Gone to Super-Star Quarterback Haskins, who is also having an Incredible and Unbelievable, Explosive Season for The Buckeyes, while Dobbins is only 85-Yards from having his Second-Straight 1,000-Yard Rushing Season, after Rushing for 1,403-Yards as a Freshman. Dobbins has already Eclipsed his 7 Touchdowns in his Freshman Season with 8 Rushing and 1 Receiving Touchdowns and Dobbins also has Incredible Measurables. Ohio Red-Shirt Senior All-Purpose Running Back A.J. 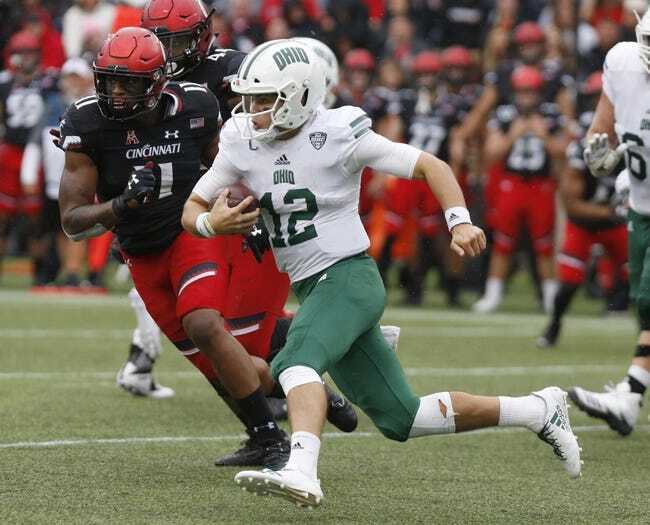 Ouellette (5-10, 209, 4.4, 38, 3.05 SH, 425 BP) had an Incredible Game Against The Buffalo Bulls as he Rushed for 196-Yards on 26 Carries and 2 Touchdowns and he also Caught 2 Passes for Another 16-Yards and Another Touchdown in The Ohio Bobcats 52-17 Victory over The Buffalo Bulls in a Key MAC East Division Game. Ouellette (#12) Absolutely Dominated this game on the ground with his 196-Yards, but he Also Caught 2 Passes for 18-Yards, including an Incredible Eight-Yard Touchdown Pass in the Third Quarter, giving him 212-Yards of All-Purpose Yards and 3 Touchdowns. This was The Third game for Ouellette for of at least 135-Yards Rushing in his last Four Games and now has 973-Yards Rushing for The Season and Needing only 27-Yards Rushing against The Akron Zips in The Regular-Season Final Game to Reach 1,000-Yards for the Season. The Bobcats have gotten themselves into The MAC East Championship Contention as they Scored Early and Often with a 646-277 Yardage-Edge while forcing Five Turnovers and they had a Huge 43-Plus Minutes of Possession Against The Bulls. Ouellette is also having an Outstanding Senior Season and he already has 3,496-Career-Yards and 30 Touchdowns Scored. A.J. Ouellette Matched J.K. Dobbins with Incredible Measurables as he Bench Pressed 425-Pounds in High School and he also Ran a Legitimate 4.3 in The Forty and did a Mind-Boggling 3.05 in The Pro-Shuttle. Ouellette also Ran a 4.4 in The Forty at The North Carolina State Summer Camp, before The 2018 Season and it was with a Sore Hamstring. Boise State Junior All-Purpose Running Back Alexander Mattison (5-11, 219, 4.47, 38, 4.09) had a Great Game Against The New Mexico Lobos as he Rushed for 145-Yards and a Touchdown and Caught 3 Passes for 40-Yards, giving him 185-Yards of All-Purpose Yardage and an 8.1-Yards Per Touch in The #23 Ranked Broncos 45-14 Victory over The Lobos. Mattison and Broncos Quarterback Brett Rypien will be Super-Stars on Offense against Fresno State in The Mountain West Championship Game. East Carolina Senior Edge Rusher Defensive End Nate Harvey (6-1, 225, 4.56) had another Outstanding Game Against The U-Conn Huskies as he Recorded 5 Tackles, including 4 Solo Tackles, 3 Quarterback Sacks, 3.5 Tackles for a Loss, 1 Forced Fumble, 1 Recovered Fumble, and 2 Quarterback Hurries in The East Carolina Pirates 55-21 Victory over The U-Conn Huskies. Harvey (#40) is having a Sensational Senior Season as he Ranks Third in The Country in Quarterback Sacks with 13.5 Quarterback Sacks and he also Leads The Country in Tackles for a Loss with 25.5 in Ten Games. The Great News for The Pirates is that there is a chance that The Pirates may be able to get his Services for Another Year. The Possibility and Potential of a Fifth Year of Eligibility for Harvey would come as a Result of his First Year at Georgia Military College in 2015 when he Should have been Red-Shirted, because he only played “A Few Plays” in The Entire Season. While Harvey declined to talk about specifics of the 2015 Season, he said he only played in “Like 12 Snaps” as a freshman in what was ruled a full year. The Pirates are Currently in The Process of putting together The Paperwork to send to The NCAA in hopes of Getting-Back another Year, in what Should have been his Red-Shirt Season with an Extra Season of Eligibility for Harvey for The 2019 Season. Harvey spent his First Two Years in College at Georgia Military College in 2015 and 2016. He then Transferred to The East Carolina Pirates as a Walk-On and he Participated in All 12 Games in 2017 as a Junior on Special Teams before moving to an Edge Rusher Defensive End this season and Becoming a Real Super-Star. Clemson Junior Edge Rusher Defensive End Clelin Ferrell (6-5, 265, 4.62) had Another Great Game Against The Duke Blue Devils as he Recorded 5 Tackles, including 2 Solo Tackles, 2 Quarterback Sacks, 2.5 Tackles for a Loss, 1 Pass Breakup, and 2 Quarterback Hurries in The #2 Ranked Clemson Tigers 35-6 Victory over The Blue Devils. The Tigers Overall Performance was not Great, but The Tigers still ended with a Blowout and Remained Undefeated with a 11-0 Record and an 8-0 Record in The Atlantic Coast Conference. In 2017, Ferrell (#99) Totaled 66 Tackles with 18 Tackles for a Loss, 9.5 Quarterback Sacks, and Two Forced Fumbles. In 2016, Ferrell had an impressive Red-Shirt Freshman Season for The Tigers as he Recorded 44 Tackles with 12.5 Tackles for a Loss, and Six Quarterback Sacks. In 11 Games in 2018, as a Red-Shirt Junior, Ferrell has Currently Recorded 38 Tackles, 10.5 Quarterback Sacks, and 3 Forced Fumbles. Since he is a Potential #1 Draft Choice, The Quarterback Sack Stats for Ferrell Draw Most of the Attention and rightfully so, but his ability to stop the run is just as Impressive and as Valuable. TCU Senior Edge Rusher Defensive End Ben Banogu (6-4, 249, 4.61, 40.4, 4.31) From McKinney, Texas had Another Outstanding Game Against The Baylor Bears as he Recorded a Career-High and Team-High 10 Tackles, including 9 Solo Tackles, 1 Quarterback Sack, 4 Tackles for a Loss, 1 Forced Fumble and 2 Quarterback Hurries in The TCU Horned Frogs 16-9 Victory over The Bears. Banogu (#15) was Especially Sensational on The First Two Offensive Plays of The Game as he Recorded a Tackle for a Loss and Forced a Fumble on The First Two Offensive Snaps of The Game for The Bears. Banogu is a Transfer from ULM and he Sat-Out The 2016 Season and then Started all 14 Games in 2017 and became one of The Top Edge Rush Ends in The Country. In that 2017 Season, Banogu Led The Big-12 with 16.5 Tackles for a Loss and was Second in Quarterback Sacks with 8.5 Sacks. He was Also Selected as the Big-12 Newcomer of the Year and First Team Big-12 All-Conference. Banogu has also been Selected as a Semi-Finalist for The Bronco Nagurski Trophy Watch List as The Defensive player of The Year. Central Florida Strongside Defensive End Titus Davis (6-3, 250, 4.72, 36) had an Outstanding Game Against The Cincinnati Bearcats as he Recorded 5 Tackles, including 5 Solo Tackles, 3 Quarterback Sacks, and a Forced Fumble in The #11 Ranked UCF Knights 38-13 Victory over The #14 Ranked Bearcats on ESPN College Game Day from The UCF Campus.